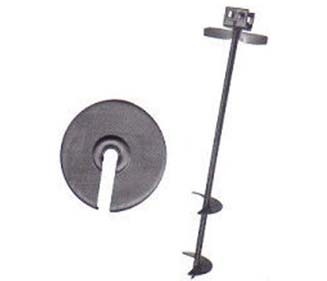 Prevents anchors from becoming loose by cutting through the soil when heavy winds occur. Required in most anchor installations. Also see Instructions. 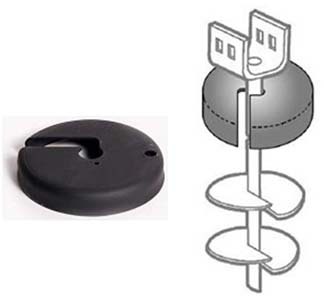 Auger Anchor Stabilizer Cap replaces standard stabilizer plates, and can be used in class 2,3 or 4A soils. 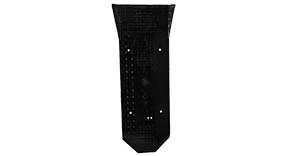 The cap may be used with either the OT3044BP (as shown) 30" Auger Anchor, or the OT3646BP 36" Auger Anchor. Also see Instructions. Easy to install; Screws into ground with anchor when you use a ZIP CAP adapter. Saves money; you don't need to stock two types of anchors. Saves space; packaged 8 to a box for easy transport. Better performance; free-floating ZIP CAP doesn't move when anchor pulls vertically. More flexibility; approved for use soil class 2 & 3 with 120004 and soil class 4 with 120019.